Virginie Millefiori’s handmade heart stud earrings capture the beauty of feeling butterflies. Sometimes butterflies flit around inside your stomach or do figure eights across your chest. (At the best times they do both simultaneously.) 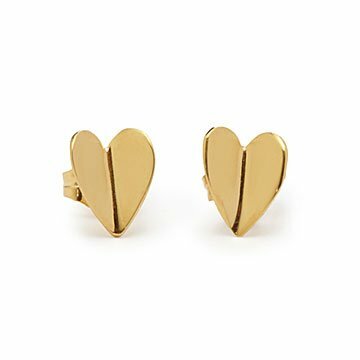 Virginie Millefiori celebrates that beautiful flutter of love with these handmade heart studs. The sides of each gold-plated silver earring move away from the center at a gentle incline, like shimmering gilded wings. A fun way to add a touch of sparkle to your attire, they also make a lovely gift for someone who makes your heart skip a beat. Handmade in New York City. When Virginie Millefiori was a kid, she wanted to grow up to be a dancer or a French braid specialist. But when it came time for college, she decided to study engineering. Though she loved science, she longed to make art. As president of her school’s drawing club, she’d spend hours sketching and painting, which led to building tiny models and then jewelry making. These were the perfect small gift for valentine's day - if I hadn't given them as a gift I'd get a pair for myself. So pretty!